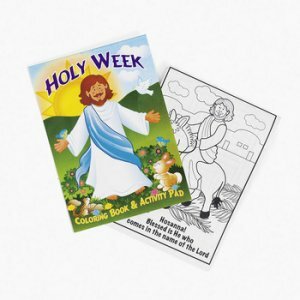 1 Holy Week Activity Book. A great fun activity book with wordsearches, spot the difference, mazes and colouring. Ideal for younger children to take home and enjoy. Each book has 12 pages of activities and measures 18cm by 12.5cm. Sample pages shown as image if you click on picture. Thanks for the great service and speedy delivery. Love the site and all the items for Sunday School. These books were great- each child had one and looked forward to colouring in at finishing off time each week.